Moving ahead in online business means never being completely satisfied. Don’t take it the wrong way - we’re not endorsing depression. But healthy questioning and a belief that there is always something to improve can only do you good. Such approach is productive especially when it comes to conversion rate. This indicator depends on many factors, improvement of which is the e-Commerce cornerstone. So, is every page of your website fully optimized and customer service advanced enough to bring the highest conversion? 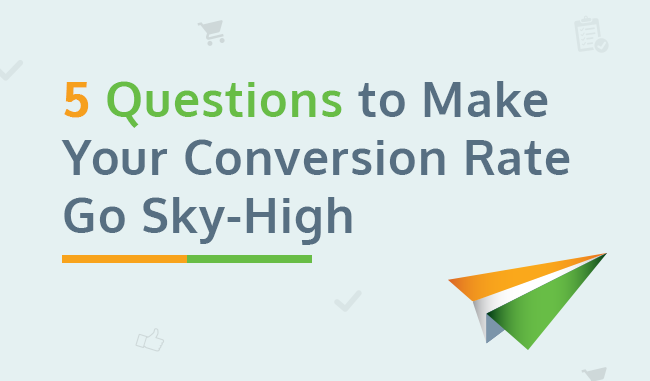 We’ll help you figure that out with 5 questions to skyrocket conversion rate. Are your product pages confusing? How much time does a shopper spend on the webpage? What’s the bounce rate on each specific page? How far down do customers scroll a page? Use heat map analysis to learn which buttons, pictures or other webpage areas do visitors click on the most. There are plenty of tools on the web like Inspectlet, Mapline or heatmap that’ll help you do so. All that data will help you understand where the bottlenecks are on your website and which of its elements need modification. Quick fact: Taloon.com increased their conversion rate by 11.9% by removing social share buttons from a product page. 2. Are there enough calls to action? Online shoppers are indecisive and easily spooked. It’s your call to persuade them you’re great, and safe, and popular, and make them click the “buy” button. The proven tool to rouse clients to action is a catchy text. So, make sure there are enough calls to action on your website and put a lot of thought into each of them, or hire an experienced copywriter. A non-obligatory statement to relax your customer and convince him he’s risking nothing. An encouragement to go for it now, without hesitation. Also, ensure your visitors see a call to action right as they show up, on the first screen. Quick fact: According to Michael Aagaard a change of the single word in his CTA led to a 14,79% increase in conversion. He changed “Order” to “Get”. 3. Is there a chat support on your website? International, intercultural, interracial - no matter how different your shoppers are they all seem to share one trait - laziness. And you have to indulge it, as a crappy parent, to make profits. Otherwise, they’ll find comfort elsewhere. So, if your clients get puzzled over something, which will happen no matter how simple your design is, make sure there is an online chat available for them. No customer wants to dig through tons of FAQs, wait a long time for a ticket reply or hold on the phone line to get answers. So, provide all clarifications right there on the page, immediately via live chat. Quick fact: 44% of online consumers believe that one of the most important advantages an online store could offer is to let customers have their questions answered by a live person. 4. Is your website indicating that you’re trustworthy? Eloquent product descriptions written by marketers will not convince a hard-boiled shopper, whilst feedback from you real customers, especially famous and respected ones, persuades visitors in minutes. So, encourage satisfied clients to leave testimonials. Put them into beautifully designed frames that include client photos - it works. According to Chris Muktar from WikiJob, testimonials increase conversion rates by 34%, so, do not neglect such a useful tool. Fill your website with security badges such as SSL certificate symbol, McAfee Secure, PayPal verified etc. Nearly 75% of customers agree that trust logos affect their sense of confidence in a particular website. So, make your shoppers feel protected. Keep your website fresh. Stale pages with no content updates scare potential customers away. So, show the visitors you’re up-to-date, show that your business is active, expanding and being constantly modernized - that’s the business they want to deal with. More practical recommendations on how to make your store trustworthy is in our dedicated article. Quick fact: According to Nielsen, 92% of consumers around the world say they trust earned media (like testimonials) above all other forms of advertising. 5. Are you using graphics? Thoughtful text is important. Descriptive terminology with numbers and abbreviations looks serious and professional, but also boring. The inner child we all carry is much more susceptible to images and videos than dry words - make an effort to please it. As in everything, it’s important not to cross the line as too many visuals can annoy your visitors. Experiment with balancing amounts of text with pictures and videos, and when you hit the right proportions your conversion rate will jump sky high. Quick fact: An explainer video (video that tells a company’s story) helped DropBox to increase conversion by 10%. To wrap up we’d like to say: “sure, you can’t control everything”. There are tons of outside factors, mostly competitors, that affect your business success. However the matter of conversion rate depends on you almost entirely. So, put plenty effort and thought into optimizing web pages. We promise, it’ll pay off.